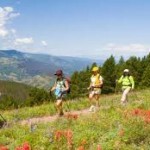 Trail enthusiasts include hikers, horseback riders and mountain bikers, many of whom report that they love the Trail. The mission of The Colorado Trail Foundation is to provide and to maintain, through voluntary and public involvement, and in cooperation with the USDA Forest Service and Bureau of Land Management, a linear, non-motorized, sustainable, recreation trail between Denver and Durango, Colorado. This trail will provide multi-day, inspirational, and educational values keyed to the diverse, high mountain, natural environment. To preserve the sense of community associated with the unique, high altitude experience achieved by participation in trail activities. To support environmental education, to be a place for healing and self-renewal, and facilitate an appreciation for the value of natural systems. To support multiple use, non-motorized, family recreation in a wide variety of unpopulated ecosystems. Mountain trail building costs usually run $12,000 per mile. The Colorado Trail Foundation, with hundreds of volunteers, builds and maintains the CT at a cost of $500 per mile with most of the costs going toward feeding the volunteers. Your contribution will help fund this successful volunteer effort.